Watercolor artist David Poxon has been invited to be a special guest Master artist at the Romanian Biennial. The Romanian exhibition is being staged by Curator Ovidiu Iovanel on behalf of the IWS organisation in the Romanian Parliament Palace in Bucharest. Other Masters invited to exhibit with David Poxon RI include Alvaro Castagnet (Uruguay) Yuko Nagayama (Japan) and Liu Yi (China). To be invited to exhibit in such a prestigious location is a real honour. Alvaro and David have appeared together in many exhibitions around the world. Alvaro Castagnet will be exhibiting with David at the International Watercolour Masters Exhibition at Lilleshall Hall England in May 2020. The Palace of the Parliament (Romanian: Palatul Parlamentului) is the seat of the Parliament of Romania. 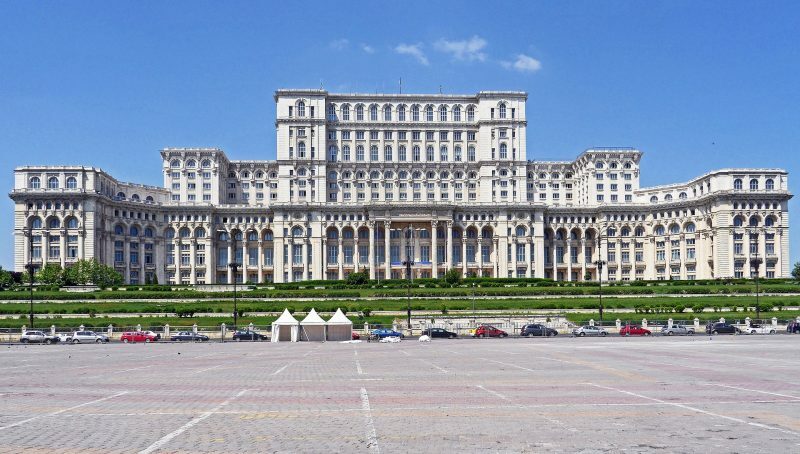 Located on Dealul Arsenalului in the national capital city of central Bucharest(Sector 5), it is the second largest administrative building in the world after the United States’ Pentagon near Washington, DC. The Palace has a height of 84 metres (276 ft), a floor area of 365,000 square metres (3,930,000 sq ft) and a volume of 2,550,000 cubic metres (90,000,000 cu ft). The Palace of the Parliament is the heaviest building in the world, weighing about 4,098,500,000 kilograms (9.0356×109 lb). A colossal building, designed and supervised by chief architect Anca Petrescu (1949–2013), with a team of approximately 700 architects, and constructed over a period of 13 years (1984–97), it was built as a monument for a totalitarian kitsch style of architecture, in Totalitarian and modernist Neoclassical architectural forms and styles, with socialist realism in mind. 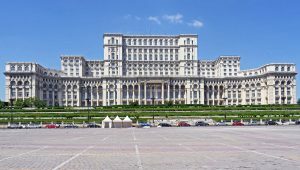 The Palace was ordered by Nicolae Ceaușescu (1918–1989), the dictator of Communist Romania and the second of two longtime autocrats in power in the country since World War II, during a period in which the personality cult of political worship and adoration was in full force for him and his family. Known for its ornate interior composed of 23 sections, it houses the two houses of the Parliament of Romania: the Senate (Senat) and the Chamber of Deputies (Camera Deputatilor), along with three museums and an international conference center. The several museums hosted inside the Palace are the National Museum of Contemporary Art, the Museum of Communist Totalitarianism (established in 2015) and the Museum of the Palace. Though originally named the House of the Republic when under its long period of construction (Romanian: Casa Republicii), after the Romanian Revolution in December 1989 it became widely known as The People’s House (Romanian: Casa Poporului). Due to its impressive endowments, events organized by state institutions and international bodies such as conferences, symposia, and others take place there, but even so about 70% of the building almost four decades later still remains empty. In 1990, Australian business and media magnate Rupert Murdoch wanted to buy the building for US $1 billion, but his bid was rejected. As of 2008, the Palace of the Parliament is valued at €3 billion euros ($3.4 billion), making it also the most expensive administrative building in the world. The cost of heating and electric use and lighting alone exceeds $6 million per year, as much as the total cost for powering a medium-sized city.